Tinkerers from the Site3 coLabratory have discovered how to make fire… with your mind! The PK4A Project uses a headset to read brain patterns and a small homemade computer to increase or decrease the flame based on the user’s cerebral input. The headset is called the NeuroSky MindSet and uses four sensors to detect two of the eight energy bands the brain produces. 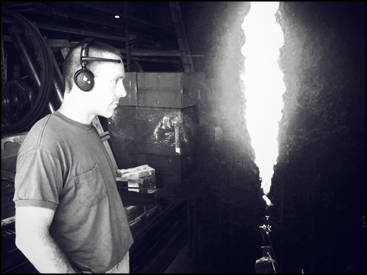 The computer interprets the brainwaves using a custom algorithm and reflects the level of activity with a massive propane flame. Safety is obviously a concern so the inventors use a ‘dead-man switch,’ which constantly has to be pressed for the device to function. While there are no plans to put the item up for sale basic specs are available on the project site. If you can’t wait to see this thing in action, here’s a video of them using it at Firefly 2010.
your saying you can control the fluctuation of the flames with your thought? what other stuff you working on.